The Mandela Washington Fellowship is the new flagship program of President Obama’s Young African Leaders Initiative (YALI). President Obama launched YALI in 2010 to support young leaders who are working to spur growth and prosperity, strengthen democratic governance, and enhance peace and security. Zainab currently serves as a Monitoring and Evaluation Officer for the Ministry of Health and Sanitation in Makeni, Sierra Leone. She also lends her expertise as a volunteer trainer, teaching data collection techniques to students who are studying to be maternal and child health aids. In the long term, Zainab aims to put her skills and knowledge toward improving health units and hospitals in Sierra Leone though better data collection and management. This desire led her to apply for the Fellowship. “YALI will help broaden my horizons to better understand how to influence policy that will, in turn, shape how my country collects data efficiently,” Zainab said. 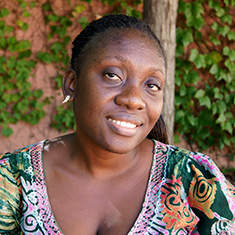 So far at DAI she has focused on developing indicators for water and sanitation programs. Zainab will soon begin work on the U.S. Agency for International Development’s Africa Lead II program, which DAI is implementing under Chief of Party David Tardif-Douglin. This summer, the Fellowship brought 500 young professionals ages 25-35 to the United States for academic study, leadership training, and the 2014 U.S.-Africa Leaders Summit in Washington, D.C. About 100 of these fellows, including Zainab, were selected to complete eight-week follow-on internships. The Mandela Washington Fellowship is a program of the U.S. government and supported in its implementation by IREX, an international nongovernmental organization and occasional partner of DAI, with more than 45 years’ experience delivering exceptional education and training programs. The fellows are a diverse group and represent some of the brightest young leaders in the 49 countries in sub-Saharan Africa. Zainab on her experience thus far: “The group has a wealth of knowledge in a wide range of issues,” Zainab said. “It’s an experience I’ll forever remember,” adding that she is “determined to implement the professional skills” she has acquired so far to make the change that is most needed in Sierra Leone and Africa as in whole.